Let’s be honest. Being a mom is HARD WORK! If you didn’t know any better you would think it’s all cupcakes and rainbows (because those are the images you’re constantly bombarded with on social media), but at the end of the day, being a mom (at least a halfway decent one) takes a lot of work and some top-notch skills! Our goal in the Positive & Purposeful Parenting community is to hep equip you with these skills so that you can be confident that you’re grooming your kids for success while creating a peaceful home environment. So today we are sharing three simple ways that you can change your language to start building more positive relationships with your kids! We’re going to look at three scenarios (that you are probably very familiar with) and look at both positive (say this) and negative (not that) responses. If you have more scenarios that you’d like positive responses for, just comment below and we’ll hook you up! Ok, are you read? Let’s do this! Your son comes to you and says, “Mommy, I’m hungry.” even though he just finished eating 10 minutes ago. Just like adults, kids want to be heard and they want to feel like you understand what they’re going through. In order to help your kids feel like you truly care about them and want what’s best for them, it’s important to validate their feelings. Not only does this approach allow your child to feel heard, it also communicates that you care enough about him to help him find a solution to his problem (which in his mind might just feel like the end of the world). Your child is super frustrated because she can’t figure out how to do her math homework. This way you’re not taking over the learning for your child. You’re showing her that you believe in her while helping build her problem solving skills AND her confidence. I know it can be hard to watch our kids struggle, but just think about much how the skills they’re developing now will help them in the future. Your son is in full-on tantrum mode because he wanted the red plate but you gave her the blue one. This helps him identify the big emotion that he’s feeling (I am so mad right now) and without making him feel bad for his feelings (which he needs to accept as being a normal part of life), you let him know that he is able to shift that emotion while showing him some love by offering to help. Win-Win! 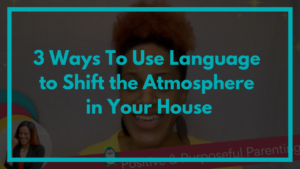 For 7 more ways to use your language to create more peace in your home, just click the link below to get access to our free e-booklet!